We are proud to announce the winners of the very first edition of our biggest annual writing contest #SweekStars! With over 8.500 published entries submitted in 9 languages (English, Spanish, Portuguese, Dutch, German, Polish, Turkish, Hindi and Russian), we are delighted to present 29 prize winners and more than 500 finalists in 15 different categories. All the winners and finalists will be bundled in the special SweekStars 2017 edition and will be offered to publish their work via publish.sweek.com. Sweek editorial team as well as over 70 jury members, comprised of writers, poets, journalists and were working day and night to ensure the best stories are chosen in their respective categories. Up to 5 finalists have been chosen in different genres, as well as in the following categories: Most Addictive Story, Most Original Story, Most Powerful Story, Best Short Story and Best Serial. We were thrilled to see that both ‘old’ Sweekers as well as new users took on a challenge to become one of the stars of storytelling! These excellent storytellers (both previously published and aspiring authors) captured the judges’ attention for weeks. From powerful poetry and page-turner sci-fi to nerve-wracking thrillers and microstories – we promise these will be reads to remember. Combined, these stories have already been read over 170.000 times and got over 67.000 followers on Sweek! 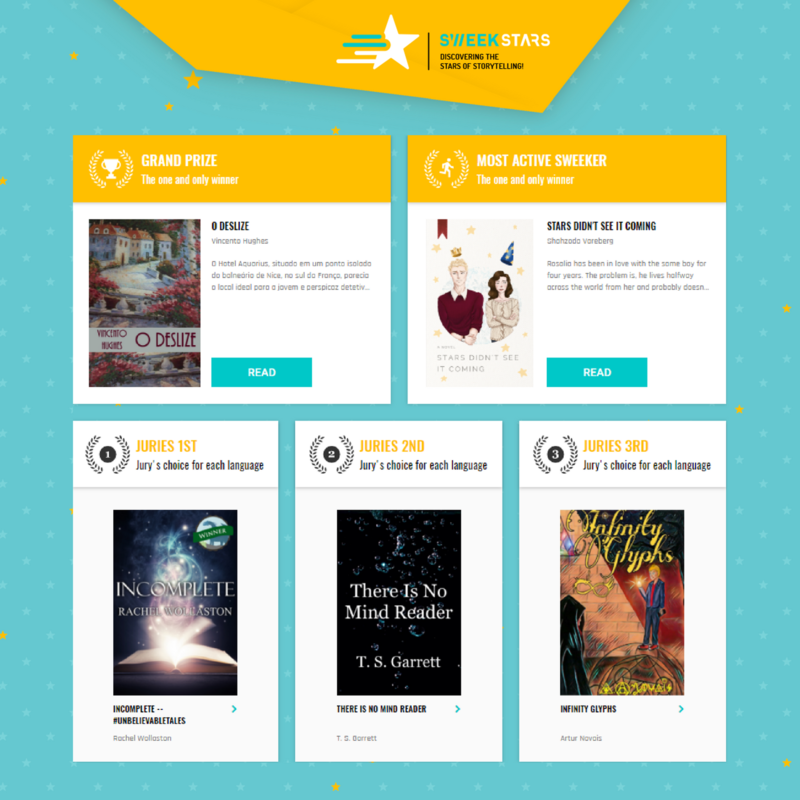 Go to sweek.com/sweekstars to see the full list of winners per language and celebrate these stars of storytelling by reading and sharing their Sweek stories! CONGRATULATIONS TO OUR SWEEK STARS! what happened to Sweekstars2017 Bundle ? First of all, sorry for the late reply - your comment had somehow been filtered as spam by our system. All but one of the 2017 bundles are ready, and the delay is due to us being understaffed; unfortunately, this means we have to prioritize the day-to-day running of the platform, keeping the contests running, etc. We sincerely apologize for keeping you waiting, but we're working as fast as we can.